Our Abpromise guarantee covers the use of ab163402 in the following tested applications. May play a role in the regulation of immune cell function. Cytokine that imparts cellular protection against viral infection in a species-specific manner. Activates the interferon-stimulated response element signaling pathway. It is able to directly modulate cytokine release from monocytes and dendritic cells. Binds heparin. Expressed in keratinocytes, monocytes and in resting dendritic cells. ab163402 on a 12.5% SDS-PAGE stained with Coomassie Blue. ab163402 has not yet been referenced specifically in any publications. Publishing research using ab163402? Please let us know so that we can cite the reference in this datasheet. 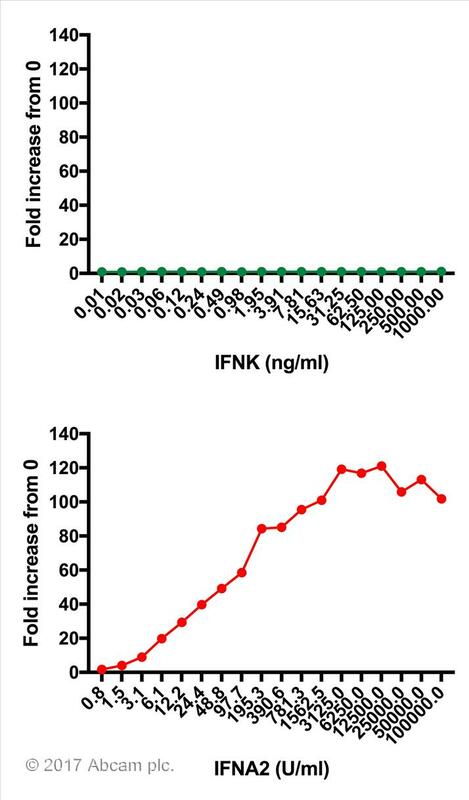 Recombinant IFNK was titrated onto a reporter cell line (HEK293-ISRE-luc clone 3C11), in which firefly luciferase expression is driven by interferon-stimulated response elements (ISREs) (Bridgeman et al. 2015, Science 349:1228-1232). Recombinant IFNA2 was included as a positive control. Luciferase activity was quantified 24 h post stimulation. The lack of luciferase signal from cells stimulated with IFNK indicates that JAK/STAT signalling downstream of the type I IFN receptor was not activated. Therefore, this recombinant protein shows no bioactivity when assayed using this system.